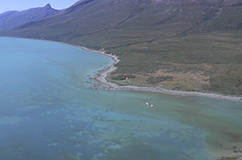 DNA extracted from old kitchen middens reveal that bowhead whale, and other large mammals, such as walrus, caribou and narwhal, constituted a larger part of the diet for ancient Greenlanders than previously thought. 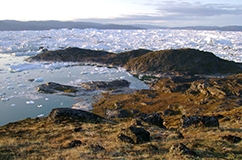 The history of human migrations into Greenland is characterized by at least three colonizations of the land by different human populations and our current understanding of the daily life of these people is highly dependent on preserved fossils excavated from the remains of their ancient settlements scattered across Greenland. The ancient perma frozen settlement Qajaa located in the Illulisat icefjord, Disko bay, West Greenland. Copyright and credits: Maanasa Raghavan (maanasa.raghavan@gmail.com) Department of Zoology, University of Cambridge, Cambridge CB2 3EJ, UK. In a new study, a group of researchers use DNA retrieved from archaeological layers to describe the hunting practices of the different human populations in Greenland from the first settlers 4500 years ago up until the Thule culture in modern times. They find that bowhead whale, and other large mammals, such as narwhal, caribou and walrus constituted a larger part of the diet than previously thought, a finding which is in stark contrast to the low number of whale bones found in the same layers. According to the authors, the lack of whale bones found in the investigated sites suggests that only whale flesh, skin and blubber was transported to the habitation sites from the hunting grounds, while the bones were left behind. The now extinct Paleo-Inuit cultures of Greenland were replaced by the ancestor of the modern day Greenlanders – the Thule culture - at around 1200 AD. The success of the Thule culture, and their swift migration from Siberia over Canada and into Greenland over a period of a couple of thousand years is traditionally ascribed to their advanced hunting strategies and technology. By introducing the kayak, the larger Umiak boat and whaling harpoons, these people were able to hunt even the largest mammals in the waters around Greenland. 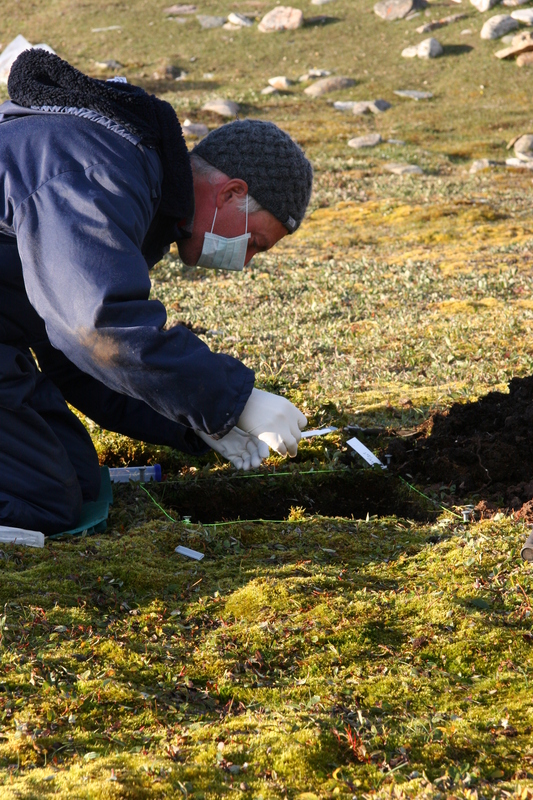 Ancient DNA sampling in the midden of the Thule Culture settlement Fladstrand, East Greenland, using sterile scalpels and wearing gloves and facemask to avoid contamination with modern DNA. Copyright and credits: Jens Fog Jensen (jens.jensen@snm.ku.dk), Centre for GeoGenetics, Natural History Museum of Denmark, University of Copenhagen. However, the recent DNA results published in Nature communications questions the view of the Thule people as the first arctic whalers. - However, we cannot rule out the possibility that whale products were in fact obtained by scavenging of whale carcasses instead. If whaling was in fact part of the Paleo-Inuit subsistence strategies, it would not have been the first time that technologies and capabilities of native people have been underestimated. - It’s a piece of cake to catch a whale - you just have to know how. Humpback whales have been taken traditionally in the Paamiut area of Greenland with a simple lance. Test pit in the midden at Fladstrand, East Greenland, with bone remains and a clearly visible stratigraphy. Copyright and credits: Jens Fog Jensen (jens.jensen@snm.ku.dk), Centre for GeoGenetics, Natural History Museum of Denmark, University of Copenhagen. The study was carried out by an international research group, led by Anders J. Hansen Associate Professor at the Centre for GeoGenetics. 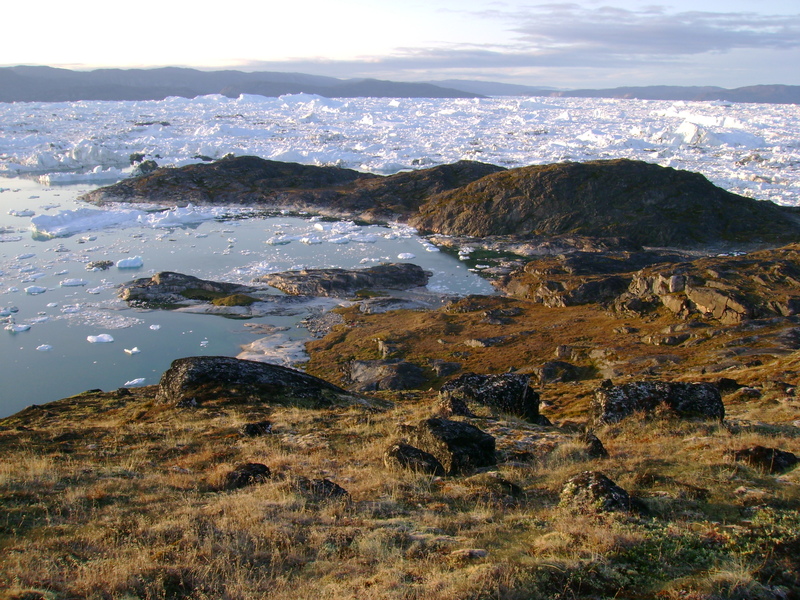 The researchers set out to study how the diet of arctic populations evolved through time and collected samples from organic layers of old household waste associated with ancient human settlements in Greenland. - That’s why we chose to collect samples from four of the really well-known and well-described archaeological sites across Greenland. 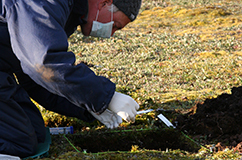 The research project is based on samples from four ancient domestic waste pits, also called midden deposits. 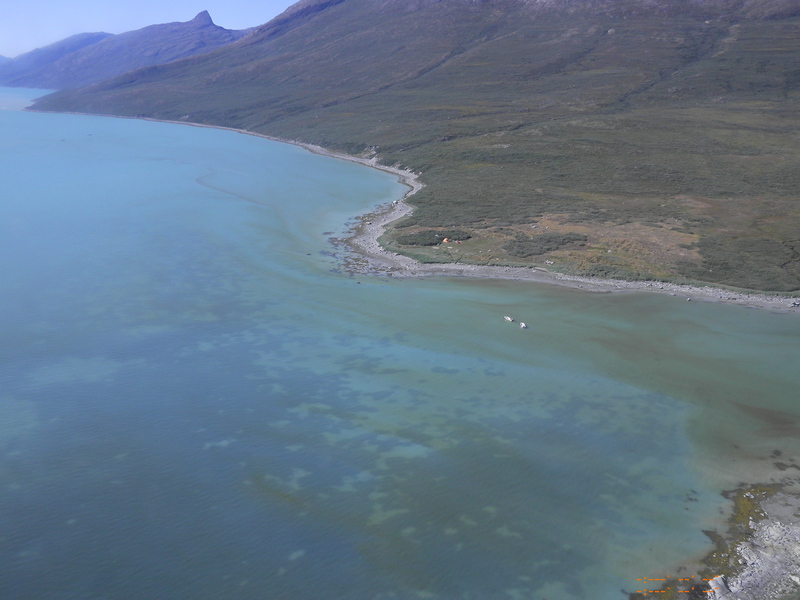 The oldest sediment samples were retrieved from two Paleo-Inuit settlements in the Disko bay, while samples from the two younger middens were collected from the remains of a Viking farmstead in the Nuuk area and the remains of a Thule-culture settlement in Eastern Greenland. The large Norse churchfarm Sandnes (centre of photo) located at the head of the Ameralik fjord. Copyright and credits: Mikkel Winther Pedersen (mwpedersen@snm.ku.dk), Centre for GeoGenetics, Natural History Museum of Denmark, University of Copenhagen. 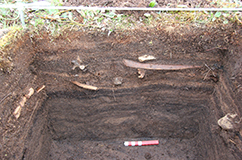 To obtain a more nuanced picture of the past environment the researchers gathered DNA directly from the soil and from parasitic eggs isolated from the same soil. By comparing the animal species identified from the soil-DNA with the parasitic DNA, the researchers could identify ancient parasite infections in the Inuit sledge dogs and in the livestock animals from the Greenlandic Vikings. - We were completely astonished by the range of different animals we found. This really shows the potential for detecting organisms which might not be preserved or represented in the fossil record, and therefore go undetected. In addition, when the researchers compared their DNA results with previous analyses of animal bones excavated from the same archaeological settlements, they found that large mammals such as walrus, caribou, bowhead- and narwhal, were underestimated in the bone record. The researchers suggest that these discrepancies reflect that the larger animals were butchered on hunting grounds away from the settlement sites. - It seems a lot more plausible to me, that only parts of the animal – mainly the flesh and blubber – was carried back home, while the bones were left behind on the beach.